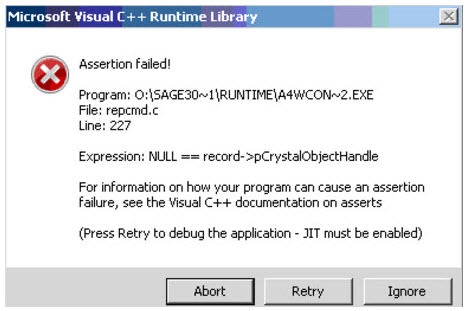 The "Microsoft Visual C++ Runtime Library error Assertion Failed!" error message is received when printing Crystal Reports in Sage 300 ERP 2012 (formerly "Sage ERP Accpac"). Please contact us for a hotifx to correct this issue. Users should anticipate uninstalling the System Manager module after the hotfix is applied. Reinstalling the System Manager and the issue should be resolved.